This important certification recognised and awarded by the OID - Digital Real Estate Observatory - following an accurate analysis to ascertain the professionalism of companies operating in a specific industry and reflecting objective criteria that in the real estate sector are at its core foundation. 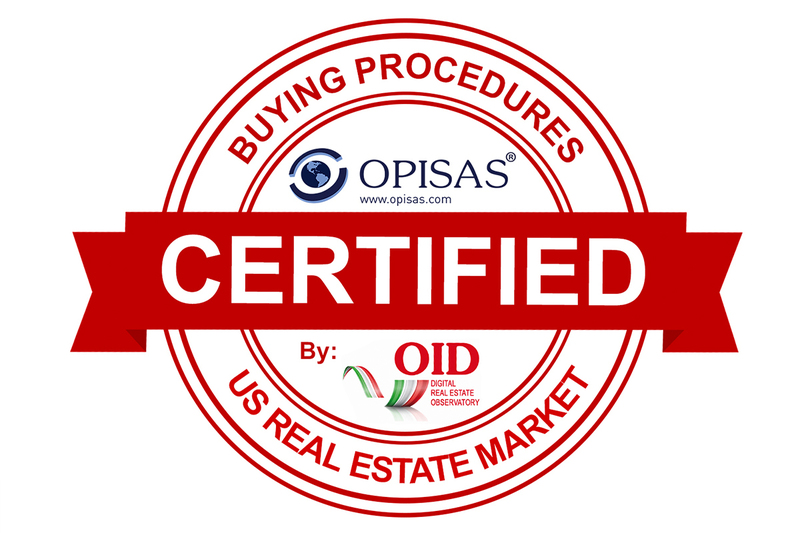 After analysing those present within the industry, the OID has recognised the certification of the purchase process for American real estate to OPISAS, an international company actively present in the sector for over ten years. This certification was issued for the following motivation: "having contributed and dedicated themselves to ensuring every sale in the USA is secure, transparent and accurate through clear procedural guidelines when purchasing". OPISAS, thanks to its offices and presence in each location in which they operate, are able to monitor the management of properties, the property tenants, relate directly with its legal and tax partners and are able to support all aspects related to the purchase of properties in the USA. OPISAS collaborates closely with the most important American and International real estate associations, whom are aware of the fact that OPISAS has purchased, renovated and resold over 2,000 properties in seven U.S. States. OPISAS supported by a bespoke software that allows them to selectively screen and acquire better opportunities for its international investors. The factors taken into consideration were, in addition to the methodology, the high quality and professional standards, partnerships with many international industry Associations that recognise in OPISAS an expert and ideal partner for their associates, with use of state-of-the-art tools, in-house control and analysis to analyze extensive real estate inventories in a short time, immediately highlighting the criticality of each single transaction. These factors have been considered to be the dedication of the company in high-level training both to industry professionals and to legal and tax professionals, a product resulting from the extensive workshops where OPISAS organising and attends as an expert in the U.S. Real Estate USA. Last but by no means least, the requisition for appearance as Speaker at the upcoming Miami International Real Estate Congress; one of the most important and anticipated events concerning the global real estate market that sees the CEO & Founder of OPISAS together with Speakers from around the world. CEO & Founder Christian Calusa issued a statement during an interview following the certification to OPISAS, of which we include an excerpt: "The Certification awarded to OPISAS in regards to its process of buying U.S. real estate properties is an acknowledgment that fills us with great satisfaction, an accomplishment testament to our constant dedication and passion which has led us to be distinguishable over others in terms of our competence and professionalism, these are the indispensable qualities of service and standard we offer. I am very proud of the goals that OPISAS has set and achieved in recent years, even overseas where we now collaborate with various trade associations that recognise OPISAS as a serious and reliable partner for their associates. My thanks to all of our loyal Customers, to our entire international network of agents and last but not least to the whole Team at OPISAS".